For my return to the cold, white winter rally, I was lucky enough to be offered a ride with one of my favorite competitors, Adam Crane. His RWD Toyota Corolla is always a blast to watch and he has a ton of fun driving out there, so I was looking forward to the weekend. We decided to drive the rally car up from Seattle to Kelowna, a 7 hour drive (plus border crossings). After a grueling, noisy ride, we were treated to a fine hostel room to prepare for recce the next day. 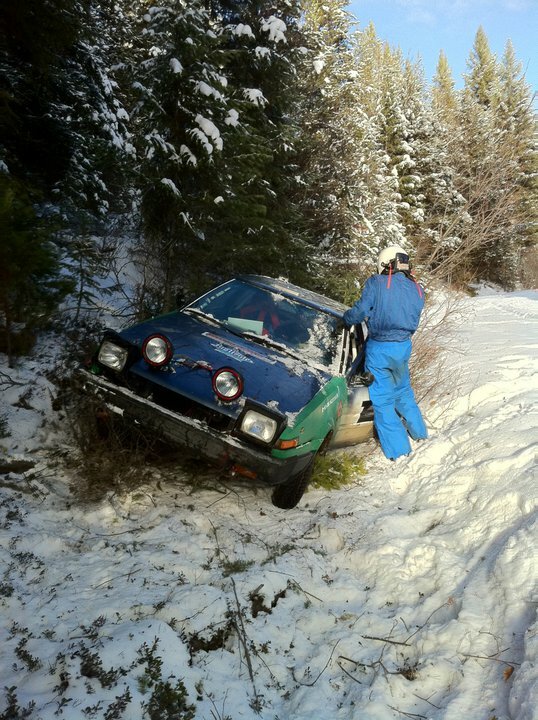 During recce, our poor 2WD car got stuck in some deep snow on an uphill section that was later cancelled. The rest of recce went swimmingly, however, and we made it through all the stages at least once before we ran out of gas. After a long haul to get more, it was back to the empty hostel for another night of preparing for the race. We woke early and headed down to the start. About 200 feet into the initial transit, we found the upper radiator hose had frozen, causing the engine to begin to overheat. Adam put on his thinking cap and quickly rerouted the hot lower hose to bypass the heater core and melt the ice in the top hose. Unfortunately, this left us without a heater for the duration of the rally. Press on regardless!! The stages were fun and the sun was out. We only had one incident, but it was to be our last incident of the rally. On a fast corner, the rear end drifted into some deep snow and no amount of cajoling could get the car to get back on the road. We slid off and took out a Charlie Brown x-mas tree, damaging the right front corner, breaking a lower tie rod, and ending our race. It was a decent off to participate in, as I got to see it coming and tucked up like a pro co-driver would. We got flat towed back to Big White, but now we were left with no transportation home. Northwest homies Brian Gottlieb and Rebecca Ruston offered to tow Adam's car home and let us drive their car back to Seattle. We took them up on the offer and enjoyed the ride in their magnificently prepared Honda. I even took a bit of a drive on the way back and enjoyed the car tremendously. That's saying a lot for a Honda. In all, my second Big White was quite a rally, even though we ended with a DNF. I'm looking forward to heading back in 2011.